Baron Hotel, P.O. Box 2531, P.C. 11361 Horriya, Heliopolis, Cairo, Egypt. The Baron Hotel Heliopolis- Cairo is located on the highest hill of Heliopolis area in Cairo overlooking the famous Baron Empain Palace. 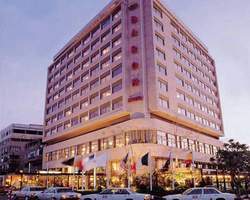 Within Cairo the hotel has a very distinctive residential location, which is comfortable and welcomes the most discerning business traveler, the Baron hotel is conveniently located in the business district of Heliopolis near all government offices and Egypt's major conference facilities and airport. Cairo International Conference Centre, the International Trade Fair and Exhibitions Ground are only a 5 minute drive from the Baron hotel , and the International Airport is only a short 10 minutes drive from the hotel . 2 KM from the most beautiful and colorful shopping district in Heliopolis. 3 KM from the biggest shopping and retail mall and cinema complex in Cairo. 5 KM from the International trade fair and exhibition grounds and Cairo's International Airport. 10 KM from the down town centre area and Cairo Opera House. The Baron hotel has 126 rooms including 14 luxurious suites with private bathrooms and superb local views of the neighborhood. (connecting rooms available). Each room has radio and television with satellite channels, Individual air-conditioning controls and mini-bar fridges. International direct dialing and message waiting system. Starlight Restaurant & Bar with a roof top panoramic view of Cairo by night and featuring the best gourmet dining with entertainment every evening. Each room has a private bathroom with mini bar and individual air-conditioning control. Radio and television satellite channels. International direct dialing service with wake up and message facilities. Shaver and electric outlets 220 volts. Telephone in bathroom and our selection of deluxe bathroom amenities. Hairdryer and full length mirror. Linen is 100% Egyptian cotton. Each suite has 2 private bathrooms and shower with superior quality. Each room has a mini bar and individual air-conditioning & control. Linen is 100% Egyptian cotton. Lounge and dining area with magnificent views of Cairo. Our selection of personalized deluxe bathroom amenities. This club style restaurant is on the top floor which provides a 360 degree view of Cairo by night. Accessed by a private elevator, the private bar offers a selection of cocktails and beverages whilst the à.la.carte menu is a gourmet selection of international dishes accompanied by elegant entertainment. Enjoy the best coffee in town blended from freshly roasted beans with our daily selection of cakes, pastries and snacks. It is the perfect place to meet your guest before or after dinner. Open for breakfast, lunch and dinner. Offering a selection of sumptuous breakfast and dinner buffet menus with carving and live cooking stations in a casual yet elegant environment with evening entertainment, open daily. Breakfast from 6.00 am to 10.30 am. Lunch from 11.30 am to 2.30 pm. Dinner from 7.00 pm to 11.00 pm. Famous throughout Cairo with a reputation that is true to this day after 25 years offering fresh home made exquisite Swiss and French pastries, gateaux and hand made chocolates, ready to serve or for outside catering orders. Should you choose a wedding, a birthday or a simple home delivery the Baron Pastry Shop has something to tempt you with, select from daily baked breads and savories, Croissant Danish and Brioche, our selection of cakes which include our famous Mille Feuille, Mud Cake, Gateaux St Honore or just an ice cream cake of your choosing, hand made chocolates and the list goes on. The Empain and Baron Ballrooms are located on the second floor of the hotel overlooking the Grand Historical Baron Palace and can cater for up to 250 guests. Recognized as the perfect local venue in Heliopolis hosting dignitaries and members of state from Cairo and over seas. We specialize in weddings and celebrations, however we also cater for Gala dinners, business luncheons, fashion shows and daytime conferences. Our dedicated banquet specialist team will help you plan your next event successfully. The Empain Hall can be divided with sliding partitions into two areas with inter­connecting doors. A full selection of audio visual equipments is available upon request. 15 telephone sockets and 5 TV points available. 15 x 10 amps sockets in Baron Hall. 22 x 10 amp sockets in Empain Hall. Please contact the hotel key person for the rental fees of the meeting rooms (Baron & Empain Hall) half and full day. Available in all function rooms. Available at no charge: Black Boards, Easels & Podium. Film Projector 16 mm. with sound. Video cassette recorder VHS or Bitamax. Flip Chart with a large pad 20" x 24". Video Camera and Spot Lights. Open 24 hours. Situated on the 1st floor levEl the business center caters for the hotel guest and international business travellers. Confidential secretarial and office services. Workstations with computer and internet access. Superbly equipped Heath Club for hotel guests and residents alike. A diverse assortment of beauty treatments. A vast choice of different massages.